Diabetes Awareness Month Nail Art! JDRF’s (Junior Diabetes Relief Fund) color to represent diabetes is blue, so I knew I had to incorporate it into the design. I decided to make a blue and white water marble on my pinky, middle, and pointer fingers using Ulta’s Snow White and Wet n’ Wild Fastdry Saved by the Blue. 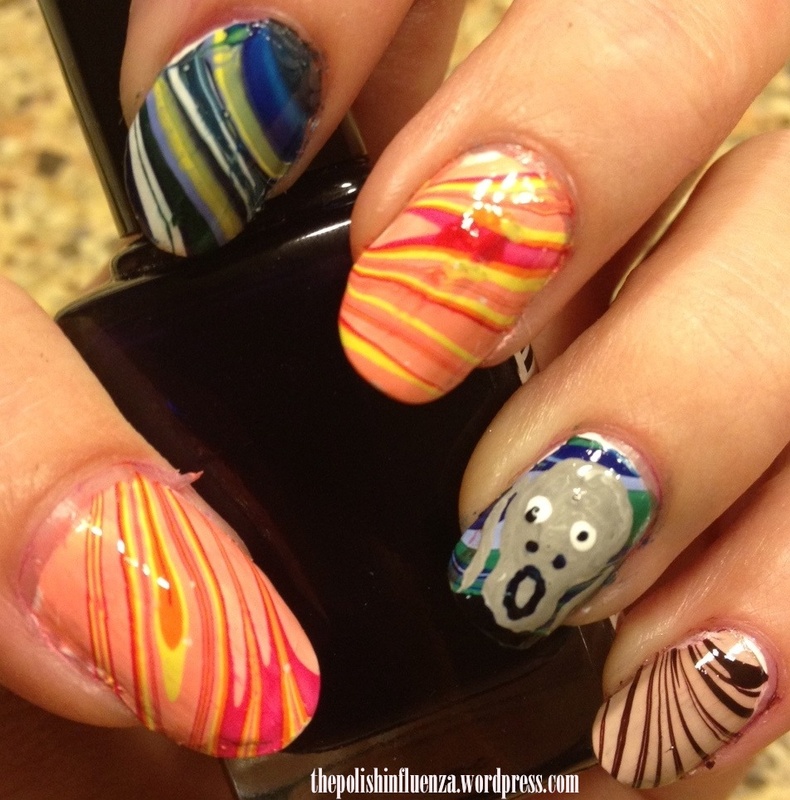 To create the water marble design, I alternated between the white and the blue, then drew random lines with a toothpick in the bullseye to create a random marbled look. On the pinky finger, I created a red ribbon on a black background, to represent the colors of National Diabetes Awareness Month. I used Love and Beauty Black for the background and Markwin Red for the ribbon. And finally, on the thumb, I painted a red background with Markwin Red, a black heart in Love and Beauty Black, and in Rue Beauté 009, I wrote Tory’s name over the heart, to represent her fight against diabetes. Pictures below are without topcoat! If anyone who reads this blog is diabetic, has a family member or friend who is diabetic, or just supports the cause, please let me know in the comments below. Diabetes needs to be stopped, and I know a cure is going to be found. Also, make sure to leave some loving for Tory below, I know she’ll appreciate it 🙂 Make sure to wear blue for diabetes this month! I know I will be. 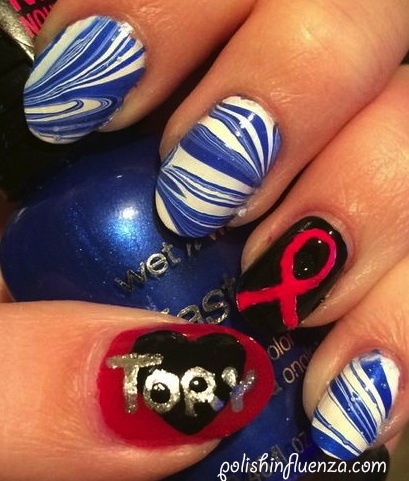 Categories: Nail Art | Tags: black, blue, Diabetes, Diabetes Awareness Month, JDRF, Love and Beauty, Markwin, nail art, nail polish, red, Rue Beauté, Ulta | Permalink. Happy Halloween From The Polish Influenza!! HAPPY HALLOWEEN! Hope everyone is having a spooktacular day! We got to wear parts of our costumes to school today (pictures at the end of the post) and there were some pretty creative ones! Of course, to celebrate the day, I did my nails up all special. 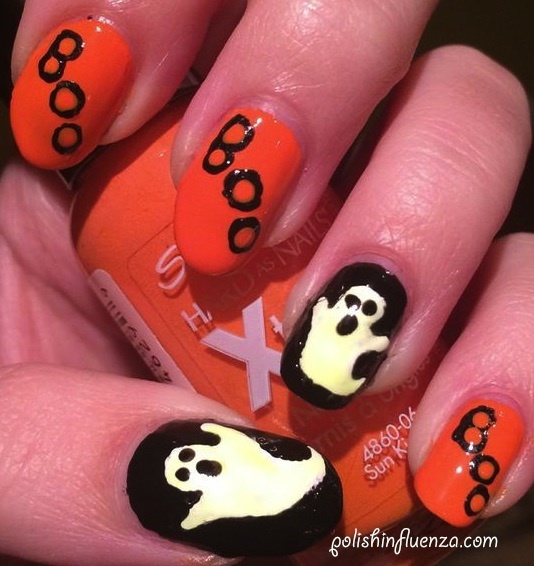 I used Sally Hansen Xtreme Wear Sun Kissed for the orange, Love and Beauty Black for my ring finger and thumb, Ulta Little Black Dress for the writing, Sinful Colors’ Snow Me White for the ghosts, and Rue 21 Glow in the Dark over the ghosts for a boo-tiful glow! Pics are without topcoat! I considered water marking this, just for the lols, but opted against it. Too much work! And of course, I can’t leave without showing you my Halloween costume! While I didn’t go trick or treating (I’m a little too old for that now- I just take candy from our own candy bowl!) I still wanted to get all dressed up. You’re never too old for that! 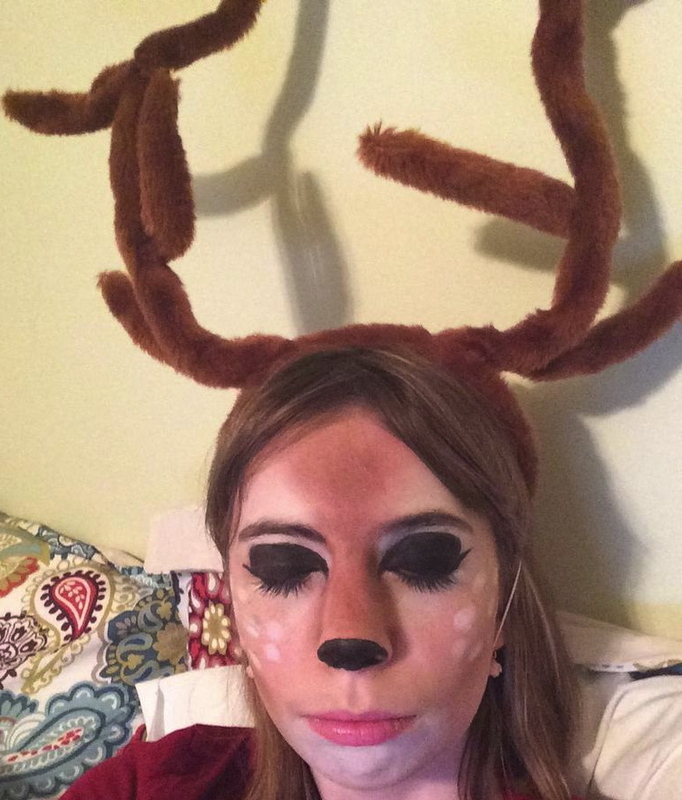 I saw an amazing makeup tutorial to transform yourself into a doe from a makeup guru called From Head to Toe. She’s got some great wearable makeup too. I followed her instructions, stuck on a pair of antlers, and voila! I have become a deer! Here’s a pic. So that’s it for me today. I hope you all had a great day full of tricks and treats! Stay boo-tiful! 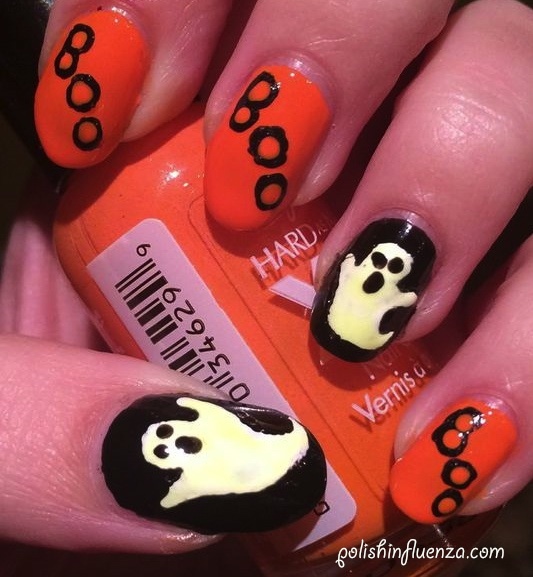 Categories: Nail Art | Tags: black, Boo, costume, deer, doe, From Head to Toe, ghosts, glow in the dark, Halloween, Love and Beauty, makeup, nail art, nail polish, orange, Rue 21, Sally Hansen, Sinful Colors, Ulta | Permalink. Today’s nails are inspired by the lovely youtuber rubikscube907. She does great nail art tutorials, Outfits of the Day, and much more, but this one particular tutorial caught my eye. 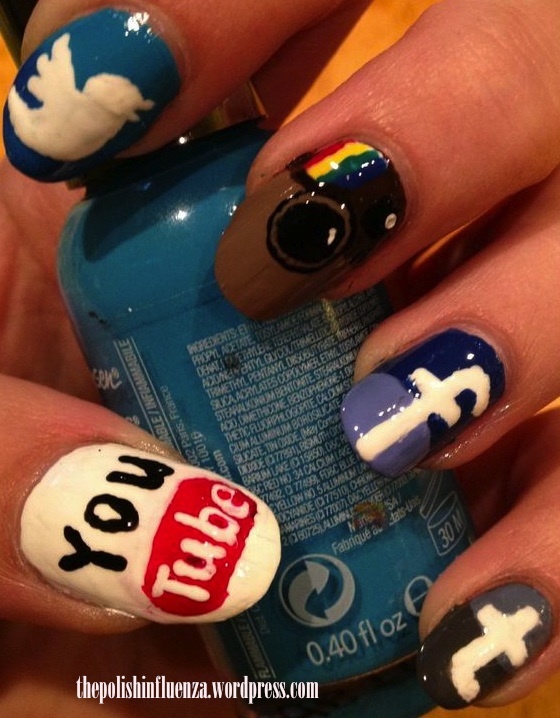 It’s social media nails! What a more appropriate way to spread the love for rubikscube907 than through social media, eh? Here’s a screen grab of her design! I hope you like my interpretation of the design! Pictures below are with OPI topcoat. If you like this design, please share it on social media! (I know, I know, cheesy). And make sure to let me know which of my nails you like the best! And also, make sure to check out rubikscube907 on youtube, she deserves your attention! The end approacheth! Tomorrow is the final day! Honor nails you ❤ is the theme, which nails will I recreate? Only time will tell! 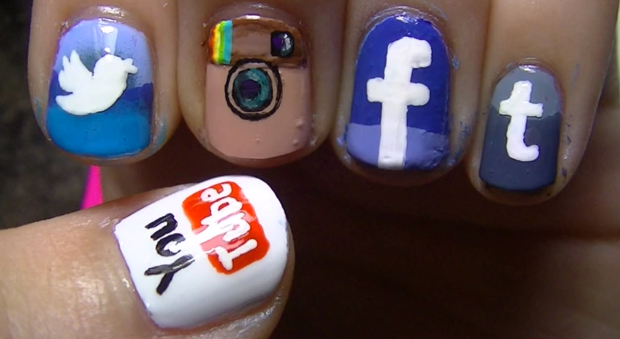 CLICK HERE TO VIEW OTHER NAIL ARTISTS’ TUTORIAL INSPIRED NAILS!!! Categories: 31 Day Challenge 2013, 31DC2013, Nail Art | Tags: black, blue, brown, camera, e.l.f, facebook, instagram, Love and Beauty, nail art, nail polish, OPI, red, rubikscube907, Rue Beauté, Sally Hansen, Sinful Colors, social media, tumblr, twitter, white, youtube | Permalink. Today’s prompt, the supernatural, was a bit difficult for me. I’m not into scary things (I’m such a crybaby at horror movies, it’s ridiculous) and dragons and phoenixes are too difficult to paint in miniature.  I then thought of ghosts, but that seemed far too clichéd. 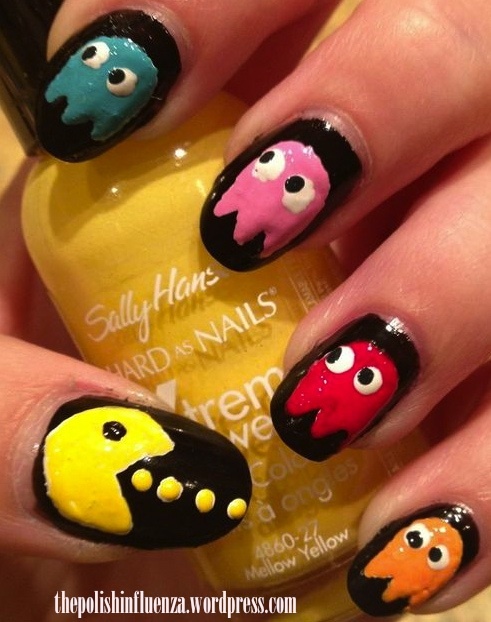 And then it hit me: what if I went tongue-in-cheek, and did Pacman ghosts. And so it went. To create my classic arcade-inspired nails, I started off by painting all of my nails with two coats of Love and Beauty Black. I then took Sinful Colors Snow Me White and drew the outlines of Pacman with his dots on my thumb and the 4 ghosts, Inky, Pinky, Blinky, and Sue, on my other fingers. I filled in the designs with white to make sure that the colors would stand out against the black. Once that had dried, I filled in Pacman and the dots with Sally Hansen Xtreme Wear Mellow Yellow, Inky with a mix of Sally Hansen Xtreme Wear Blue Me Away and Mint Sorbet, Pinky with a mix of Love and Beauty Pink Creme and Snow Me White, Blinky with e.l.f. Smokin’ Hot, and Sue with Mellow Yellow and Sally Hansen Xtreme Wear Sun Kissed. Once those colors dried, I put little white dots on the ghosts for eyes, and put a black dot inside of them. 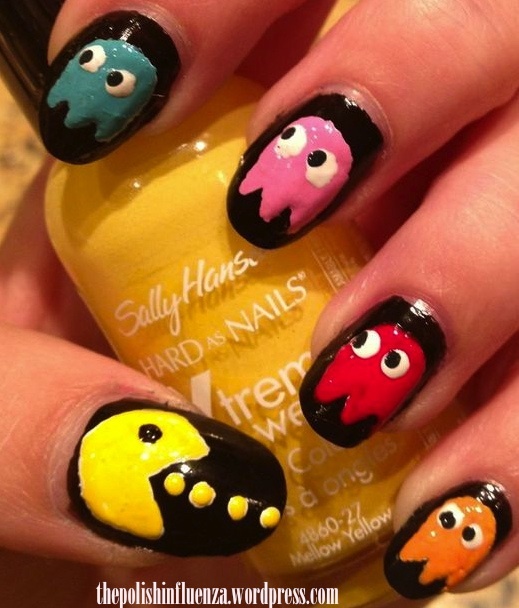 And Pacman has come to life on my nails! Pictures below are without topcoat. So it’s not quite spooky or scary, but it sure is cute! ^__^ Sue is a little cross-eyed, but hey, she was always the odd one out xD Let me know if you like Pacman too in the comments below! Only TWO DAYS LEFT of the 31DC2013!!! I can’t believe how fast time flies! I hope you all have enjoyed it as much as I have 🙂 Tomorrow is “inspired by a tutorial”, so if you have a favorite tutorial, make sure to let me know in the comments! I always need inspiration! 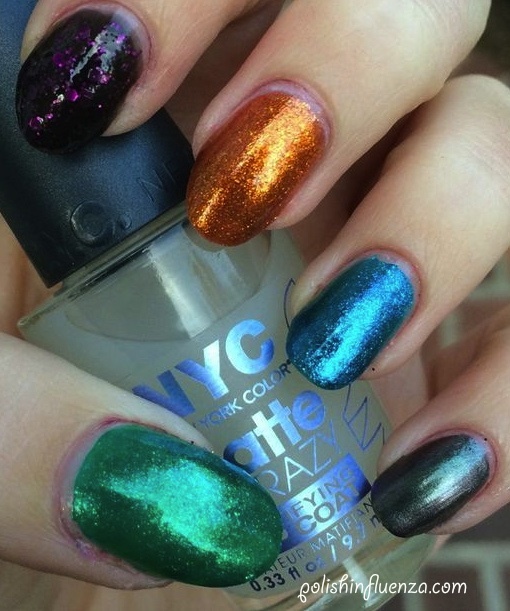 CLICK HERE TO VIEW OTHER NAIL ARTISTS’ SUPERNATURAL INSPIRED NAIL DESIGNS!!! 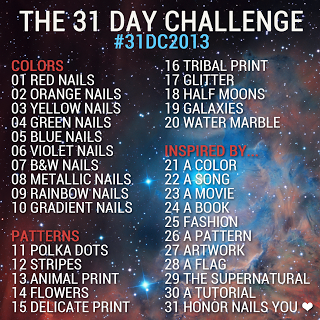 Categories: 31 Day Challenge 2013, 31DC2013, Nail Art | Tags: 31DC2013, arcade, blue, e.l.f, Love and Beauty, nail art, nail polish, orange, Pacman, pink, red, Sally Hansen, Sinful Colors, supernatural, white, yellow | Permalink. So, I’m using today’s 31DC2013 theme as an announcement. I’m going to be going on my very first trip to Europe this summer! I’m taking a cruise, so I’m going to have the opportunity to see multiple countries. 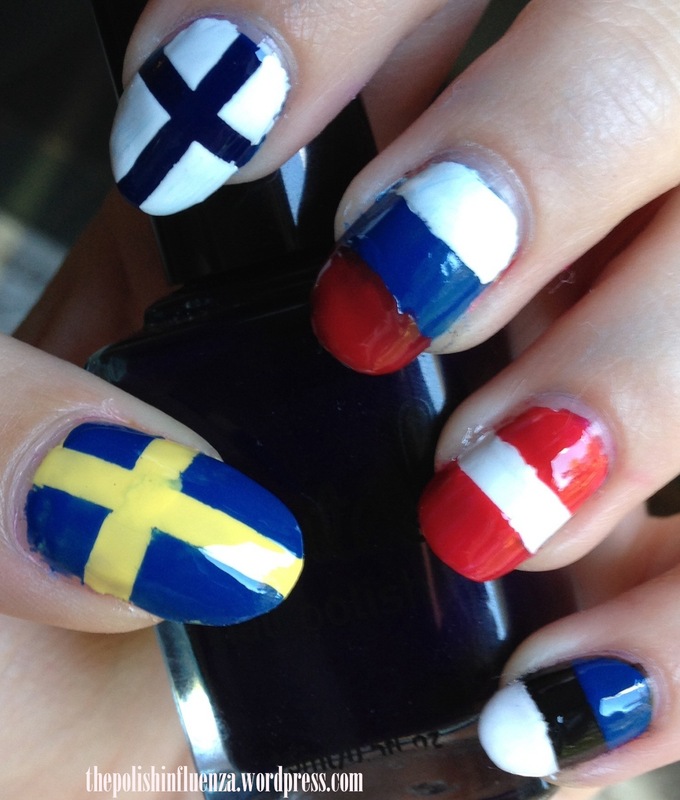 And today, my nails are representing the countries I’ll be visiting. So, without further ado…. To create today’s design, I used the tape manicure technique. I started with a base of Sally Hansen Xtreme Wear Mellow Yellow on my thumb, Rue Beauté 043 on my pointer finger, e.l.f. Skinny Jeans on my middle finger, Sinful Colors Snow Me White on my ring finger, and Love and Beauty Black on my pinky. I made tape crosses on my thumb and pointer finger, and a strip of tape down the middle of my middle finger, ring finger, and pinky. I painted Skinny Jeans over my thumb, Snow Me White over my pointer finger, e.l.f. Smokin’ Hot on the tip of my middle finger and Snow Me White on the base, Smokin’ Hot on my ring finger, and Skinny Jeans on the base of my pinky, and Snow Me White on the tip. I peeled off the tape, and ta da! Lots of flags, in the order of my itinerary! Pictures below are with OPI topcoat. I hope you guys like them! And to my viewers from these 5 countries, what are the best local nail polish brands, and where can I find them when I’m on my vacation? I’d love to be able to pick up some foreign lacquers as souvenirs! We’re winding down on the 31DC2013, folks! It’s been one crazy ride, no? Tomorrow is a supernatural inspired design. Oooh, ghosts and monsters and witches! Can’t wait! 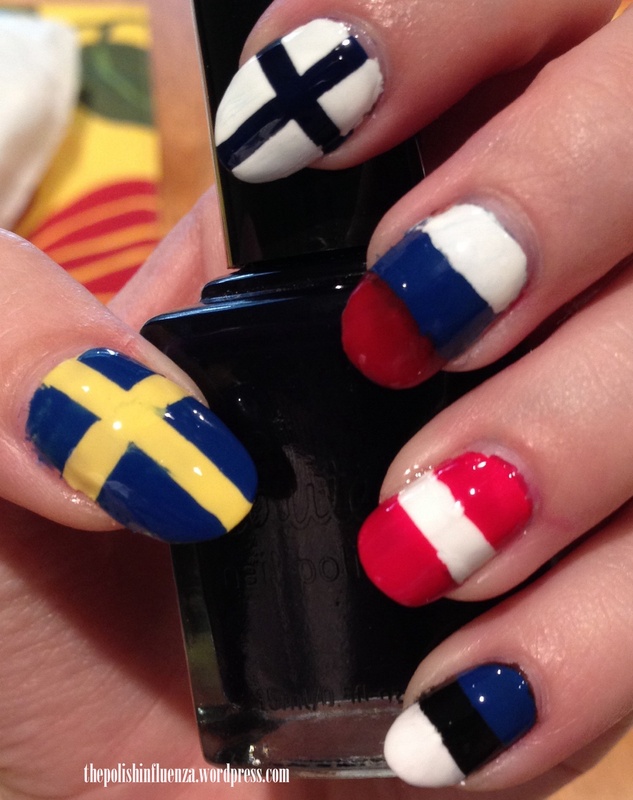 CLICK HERE TO VIEW OTHER NAIL ARTISTS’ FLAG INSPIRED DESIGNS!!! Categories: 31 Day Challenge 2013, 31DC2013, Nail Art | Tags: 31DC2013, black, blue, e.l.f, Estonia, Finland, flag, Latvia, Love and Beauty, nail art, nail polish, navy, OPI, red, Rue Beauté, Russia, Sally Hansen, Scandinavia, Sinful Colors, Sweden, tape, white, yellow | Permalink. I’m going to admit, today was a struggle. I’m really no artist, I just happen to be good with nail polish. I swear, when I pick up a paintbrush or colored pencil and try to do this stuff in real life, the end result is horrific. I don’t know why it always works on my nails, lol! 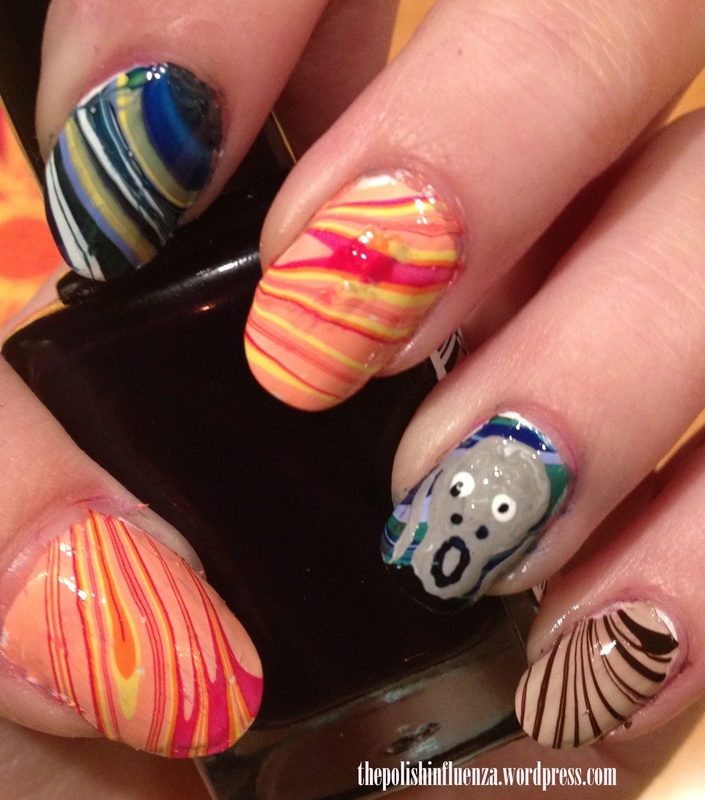 So having to put a real life work of art on my nails was kinda terrifying! In the end, I’m pleased with the result, and I hope you agree with me! 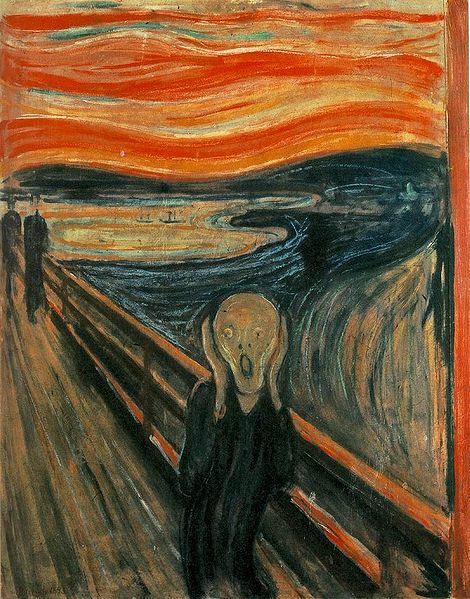 My inspiration for today’s design came from the painting The Scream by Edvard Munch. It’s very surreal, which I love because of its abstract nature. I immediately knew that I wanted to emulate the swirls of the paint through water marble, and I separated the color patterns into three parts: the oranges, yellows, and reds of the sky, the blues of the water, and the browns of the bridge. I started by painting all of my nails white (Sinful Colors Snow Me White) to get the best and boldest water marble. To get the sun-lit sky, I put drops of Essie Tart Deco, e.l.f. Smokin’ Hot, Sally Hansen Xtreme Wear Mellow Yellow and Sally Hansen Sun Kissed into a bowl of lukewarm tap water. I used a toothpick to draw random, linear patterns, and dipped my thumb and middle finger into the mix. To get the water, I put drops of Rue Beauté 043, Rue Beauté 033, e.l.f. Lavender Mist, Sally Hansen Xtreme Wear Mellow Yellow, and Sinful Colors Snow Me White into a bowl, created the same linear pattern, and dipped my pointer and ring fingers into the mix. For the bridge, I mixed Rue Beauté 004 and Rue Beauté 063 in the same linear pattern, and just dipped in my pinky. For the scream himself, I mixed together Snow Me White, 004, and Love and Beauty Black on a palette, and freehanded the shape of his face on my ring finger. Once that dried, I used a mix of black and the navy 043 to freehand the mouth and eyes. I then used the grey mixture to draw on his hands next to his face. And ta da! Art on my fingers! Pictures below are with OPI topcoat. So there’s my version of art. Please share if you like it! It means a lot to me! 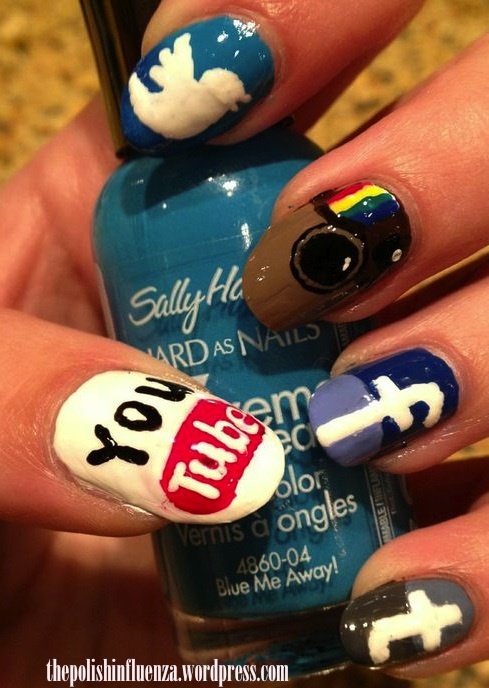 And I really want to see all of your amazing nail art designs as well, so make sure to share them! Tomorrow is flag inspired day. I already have my design planned and ready to go! Come back tomorrow to see what I have in store! 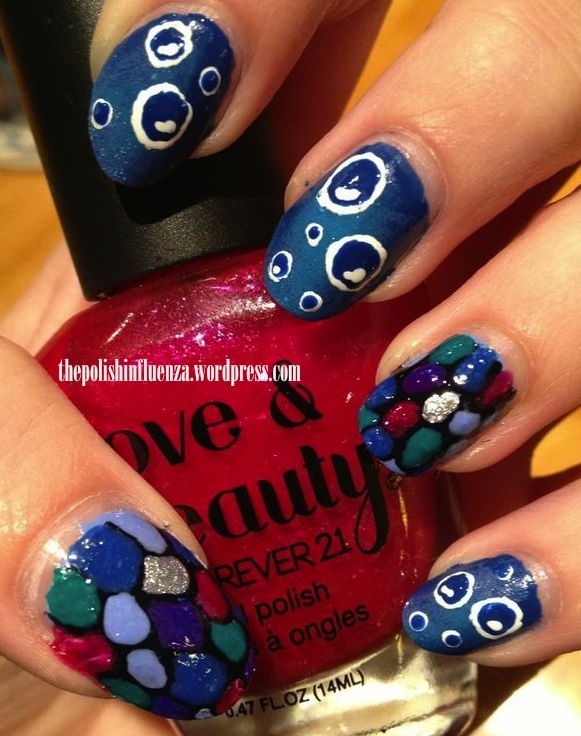 CLICK HERE TO VIEW OTHER NAIL ARTISTS’ ARTWORK INSPIRED NAIL DESIGNS!!! Categories: 31 Day Challenge 2013, 31DC2013, Nail Art | Tags: 31DC2013, abstract, artwork, black, blue, brown, e.l.f, Edvard Munch, Love and Beauty, modern art, nail art, nail polish, navy, orange, red, Rue Beauté, Sally Hansen, Sinful Colors, tan, The Scream, water marble, white, yellow | Permalink. 5 DAYS LEFT!!! I cannot believe that this 31DC2013 has gone by this fast. I really think that I’ve gotten much better at nail art during this month. I hope you guys think so too! Today’s design was inspired by this lovely pattern I found on Google. I originally wanted to do a triangular/geometric design, but I couldn’t find something I liked. This just screamed at me: Look at those colors! And I had colors in my stash that I knew could do this pattern justice, so I got started! Once the zigzags were complete to my satisfaction, I finished it off with OPI topcoat! Pictures are below! So what do you think of the design? 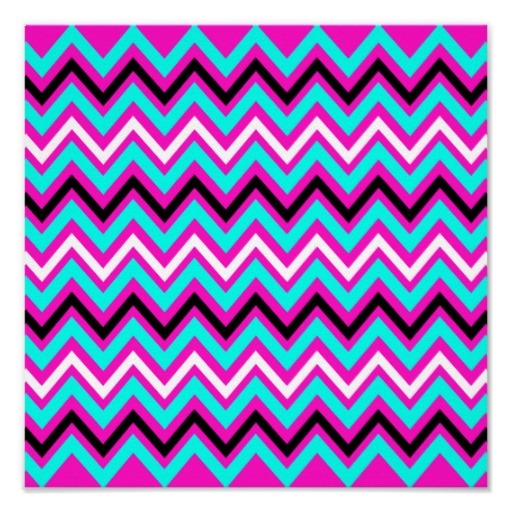 I know stripes and zigzags have been done thousands of times, but I hope you like my color choice and execution! We’re nearing the end of the challenge, folks! Tomorrow is “Inspired by an Artwork” day. 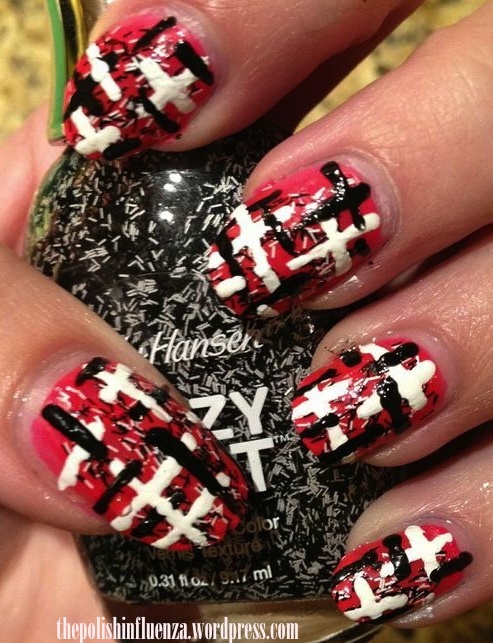 Isn’t all nail art considered art? This should be easy! 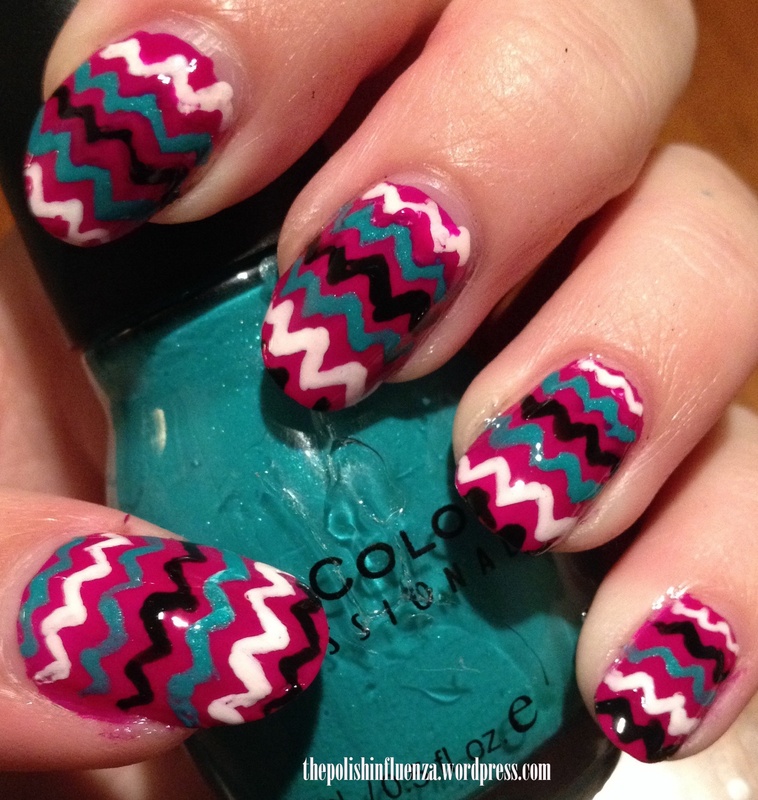 CLICK HERE TO VIEW OTHER NAIL ARTISTS’ PATTERN INSPIRED NAILS!!! 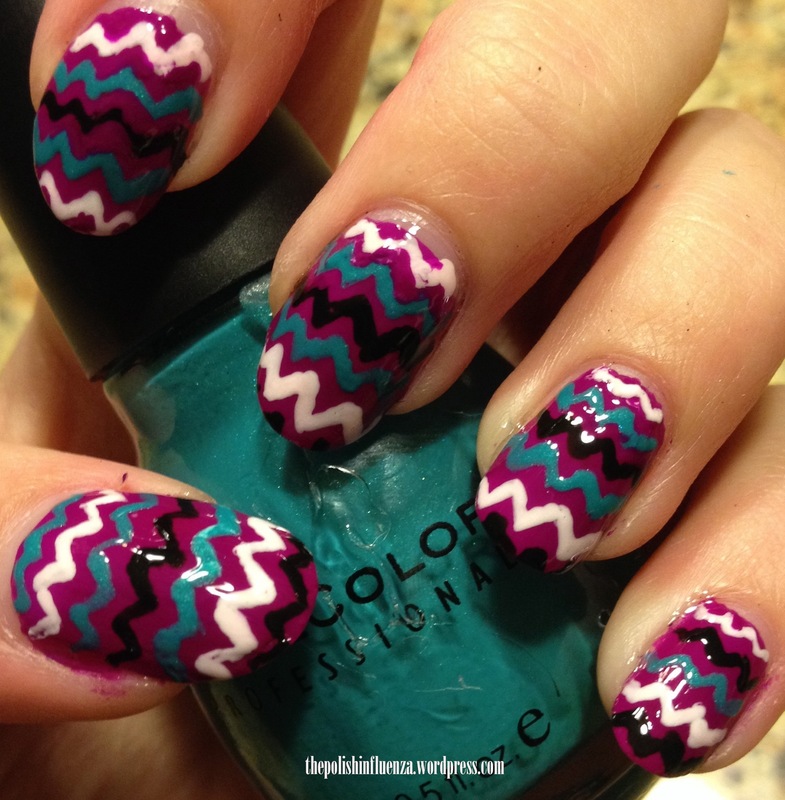 Categories: 31 Day Challenge 2013, 31DC2013, Nail Art | Tags: 31DC2013, black, Love and Beauty, nail art, nail polish, OPI, pink, purple, Sinful Colors, stripe, teal, white, zigzag | Permalink. Less than a week of the 31DC2013 to go! I can’t believe we’ve all gotten this far! Kudos to all who have been involved in such a taxing challenge. The nail art that has come out of it has been fantastic! Let me tell you, it’s going to be hard to pick a favorite look come day 31! 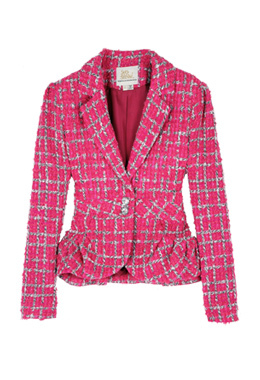 To create my pink coat design, I started with two coats of Claire’s Hot Stuff (reviewed in this week’s On Wednesdays We Wear Pink segment!). Once that dried, I applied one generous coat of Sally Hansen Fuzzy Coat topcoat in Tweedy, to create the tweed fabric effect on the nail. I then took Sinful Colors Snow Me White and Love and Beauty Black with toothpicks, and drew random, overlapping lines to create a tweed effect. It’s such a simple design with such a fun end result! Pictures below are without topcoat. I hope you guys like this! And make sure to give Michelle some love too, she’s the original creator! Tomorrow’s look is inspired by a pattern. Oh boy. Tune in tomorrow to see what I choose! 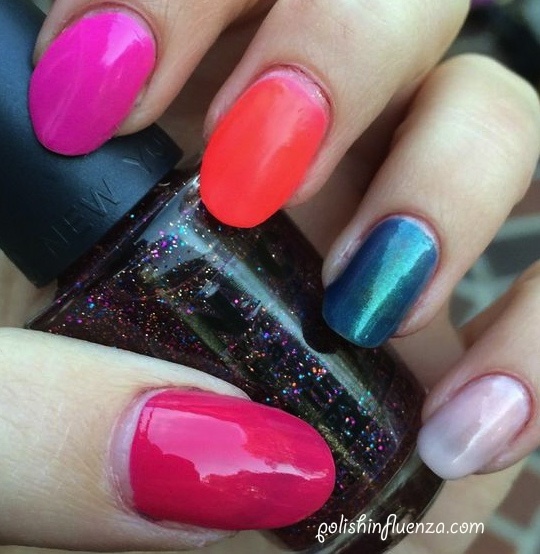 CLICK HERE TO VIEW OTHER NAIL ARTISTS’ FASHION INSPIRED NAIL DESIGNS!!!! Categories: 31 Day Challenge 2013, 31DC2013, Nail Art | Tags: 31DC2013, All Lacquered Up, bar glitter, black, Claire's, fashion, fuzzy coat, Love and Beauty, Michelle Mismas, nail art, nail polish, pink, Sally Hansen, Sinful Colors, textured, tweed, white | Permalink. 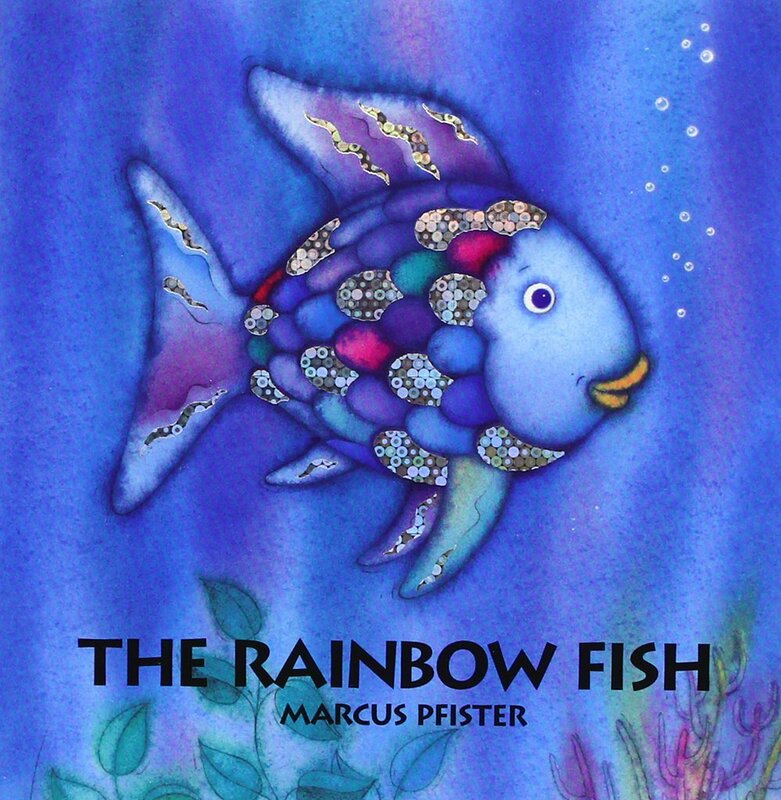 The book I’ve selected as my inspiration is The Rainbow Fish by Marcus Pfister. It’s a classic children’s book written to display the joys of sharing with others. Just like I’m doing with my manicure today- sharing it with you! I started of with two coats of e.l.f. Skinny Jeans on my pointer finger, middle finger, and pinky, and two coats of e.l.f. Lavender Mist on my thumb and ring finger. 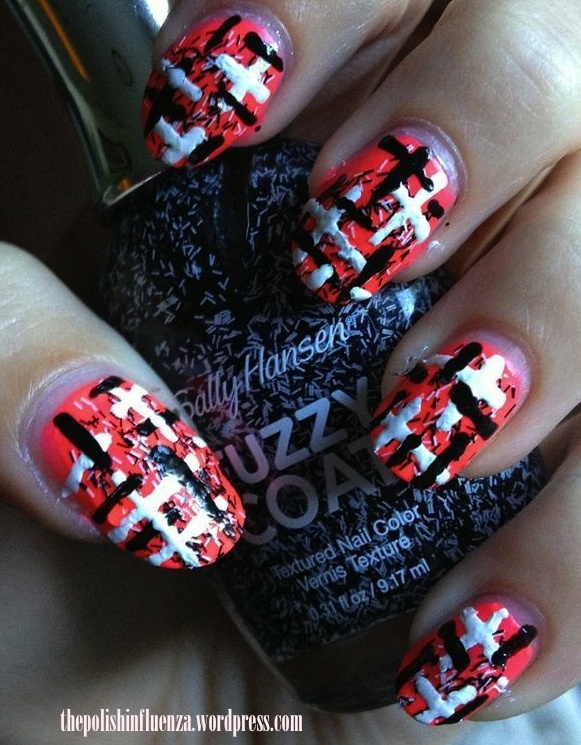 On my two accent nails, I used Love and Beauty Black on a toothpick to draw the outlines of fish scales. On the other three nails, I took a makeup sponge torn into little chunks and dabbed on Lavender Mist and Sally Hansen Xtreme Wear Blue Me Away in small patches to create depth to the ocean. I finished off those nails with Sinful Colors Snow Me White circles to represent bubbles (as seen on the cover of the book). To finish off the scale nails, I took Rue Beauté 040, Love and Beauty Red, Lavender Mist, Skinny Jeans, and Sinful Colors Dream On and put drops of each color on a paper plate (which I use as a palette). 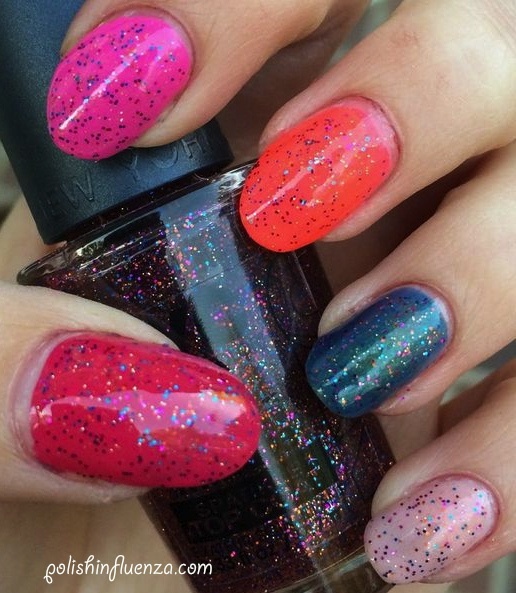 I mixed a drop of Ulta Glass Slipper (a glass shard topcoat shown here) to each color to give them shimmery effects. I then randomly placed the colors inside the drawn scales. On one scale per nail, I used Sephora by OPI Bring on the Snowflakes to serve as the Rainbow Fish’s iconic silver scale. 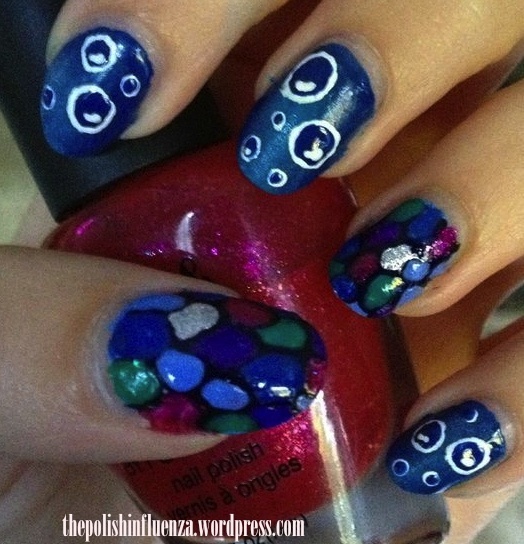 I sealed in the design with Ulta Color-Enhancing topcoat and my fishy design was finished! Pictures are below! I hope you guys love this design! Maybe it’ll spark some childhood nostalgia like it did for me! Tomorrow’s design is “inspired by a fashion”. I have a pretty good idea what I’m doing for this one, so stay tuned for tomorrow design! 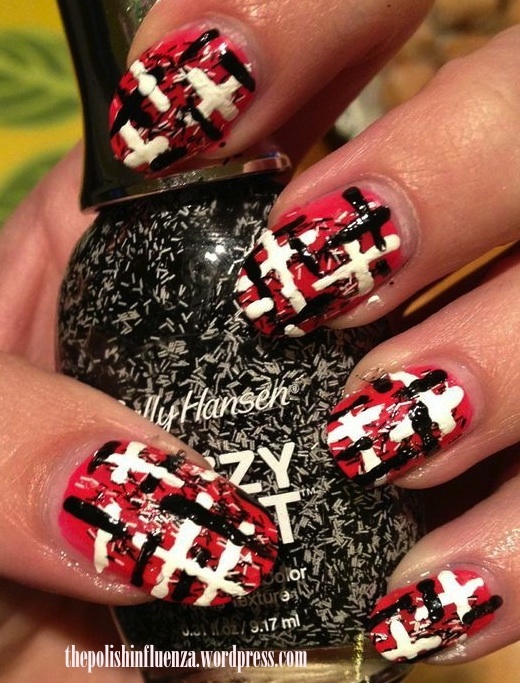 CLICK HERE TO VIEW OTHER NAIL ARTISTS’ BOOK INSPIRED NAILS!!! Categories: 31 Day Challenge 2013, 31DC2013, Nail Art | Tags: 31DC3013, black, e.l.f, glass shard, green, Love and Beauty, Marcus Pfister, nail art, pink, Rainbow Fish, Sally Hansen, Sephora by OPI, silver, Sinful Colors, story book, teal, Ulta, white | Permalink.